In the fall of 485, a teenager named Paralius arrived in Alexandria to study under the grammarian Horapollon. The youngest of four brothers, Paralius had grown up a child of some privilege in the pleasant city of Aphrodisias, the inland capital of the Roman province of Caria and an important center for pagan intellectual pursuits in the later fifth century. Paralius belonged to one of the families contributing to the city's cultural vibrancy. Although his parents had died while he was still a child, Paralius's brothers Proclus and Democharus ensured that he received a high-quality education. Proclus, who taught rhetoric in the city, probably handled Paralius's training when he reached the appropriate age for grammatical instruction to begin. The trip to Alexandria represented the next stage in Paralius's education. Like his brothers before him, Paralius was in line to receive the most complete and socially respectable education that the late Roman world offered. This consisted of a solid background in basic letters followed by formal instruction in grammar. In his late adolescence, Paralius would graduate to a school of rhetoric. By the fifth century it had become popular to cap this education either with some philosophical study or with a more practical legal training. Their own educational background suggests that Paralius's brothers expected him to progress through each of these educational levels-and he was to do it at the best schools available. Paralius's trip to Alexandria represented a natural step in this process. In the late 480s, Alexandria stood out as the finest center for grammatical and rhetorical teaching in the eastern Mediterranean. This is not to say that it was the only such center. We know that, in 485, Paralius's brothers could have sent him to well-regarded teachers in Athens, Gaza, or Damascus as well as any number of other places whose teachers have passed unremembered into silence. At this point in time, however, the brightest and most ambitious children of the eastern Mediterranean elite congregated in Alexandria. Paralius's family was closely joined to the social and intellectual network that linked the major teaching centers of the eastern Mediterranean and must certainly have worked through the delicate calculus of campus rankings familiar to many ambitious American families today. The Alexandrian grammatical and rhetorical schools were the Harvard or Yale of their day and the opportunities they afforded to their graduates more than offset their considerable financial and emotional cost. When Paralius arrived in Alexandria he would have met fellow students who came from areas as diverse as Gaza, Pisidia, and Syria. The fame of Alexandria's schools certainly drew these young men, but the powerful reputation of some Alexandrian teachers also exerted a considerable attractive force. In the case of Paralius, the teacher with whom he was most familiar was Asclepiodotus. The son-in-law of a prominent city councilor in Aphrodisias, Asclepiodotus had lived in that city for a number of years. An Alexandrian by birth, Asclepiodotus and his wife spent the first part of their married life in Caria before moving back to Alexandria in order to get fertility treatments at a local shrine to Isis. News about Asclepiodotus and his Alexandrian colleagues continued to reach Aphrodisias during Paralius's childhood. He and his brothers heard about the miraculous conception of Asclepiodotus's child and learned, possibly again from an Alexandrian source, about the brewing revolt of the Isaurian general Illus. Indeed, the connections between his family and Alexandria seem to have been extensive and, when the time came to send Paralius abroad, his brothers entrusted him to the teacher Horapollon. After an exchange of letters introducing Paralius to him, Horapollon accepted Paralius into the school and assumed general responsibility for the youth's spiritual and intellectual well-being. A late antique school enabled this sort of personal supervision. Even in a large teaching environment like Alexandria, professors handled a manageable number of students, probably never more than one hundred and usually far fewer than that. Often professors worked to foster a degree of cohesion within their cohort of students. Some schools conducted elaborate initiation rituals during which a new arrival would swear an oath to study under a certain teacher or group of teachers. In some cases, he would also promise to stay away from the classes of rivals. Once he had formally agreed to join the school, the intellectual community initiated the new arrival. While the specifics of the rituals probably varied between (and even within) intellectual centers, there does seem to have been a similar format to them. The new student was initially treated as an outsider and mocked as an inferior by the older students. In fourth-century Athens, for example, this involved both verbal mockery and the threat of physical violence (if not an actual beating). Elsewhere the hazing was probably confined to taunts and teasing that reinforced an initiate's lowly status within the scholastic community. Once the new arrival passed through this ritual entry, he would be accepted as a legitimate member of the school. In some cases, he would be given the privilege of wearing a distinctive scholarly robe. Though the threat of violence receded after a student's initiation, taunts and teasing apparently continued to reinforce his inferior status within the scholastic community for much of his first year. Despite their lower status, many new students like Paralius found their schools neither unwelcoming nor unfamiliar. In fact, it was common for teachers and students alike to describe their relationship to others in the school in familial terms. Students described their teachers as "parents" and their peers as "brothers." This personal intimacy was fostered by a curriculum that emphasized the value of close friendships and it was sustained by other, less savory, communal activities. Throughout antiquity, students studying abroad were known for their ability to squander large sums of money on parties that, put charitably, enhanced the cohesion of a student body. Older students also displayed a more alarming tendency to brawl with the members of other schools in collective expressions of loyalty that either defended the honor of their professor or enhanced the profile of his school. What is important about such things, however, is not that ancient students were a wild bunch but that, in most cases, these actions were performed as a part of a group. If a new student like Paralius accepted this environment and the terms of his initiation, he would find a close-knit group of peers led, at least in theory, by a supportive professor. This taught him to value new relationships with people who did not share his familial and regional background. It also illustrated to him that, within an academic environment, a distinctive code of behavior existed that could render acceptable behaviors that were normally unacceptable (like street fighting) if they either enhanced a student's integration into the school or furthered the school's interest. While most late antique students failed to exhibit the sort of loyalty to their schools that ancient sources idealize, the physical setting in which teaching occurred influenced scholastic loyalties and interscholastic rivalries. This was particularly true of the space in which Horapollon taught Paralius. Horapollon shared what seems to have been a complex of classrooms with the philosophers Heraiscus, Isidore, Ammonius, Paralius's family friend Asclepiodotus, and, probably, the grammarian John Semeiographos and the rhetorician Sopater. Some of these teachers also shared students with one another. Horapollon certainly cooperated with his father, Asclepiades, and his uncle Heraiscus. He may have allowed students to work with Isidore and Ammonius as well. It also seems that John Semeiographos and Sopater had some sort of arrangement for student exchange. When Paralius arrived in Alexandria, he found himself immersed in this world. Though acquainted with his teacher Horapollon and his colleague Asclepiodotus, Paralius had a hard time adjusting to his new environment. Perhaps sensing this, Horapollon took an interest in making Paralius feel at ease, even going so far as to accompany him to religious services. Nevertheless, Paralius remained uncomfortable and decided to take a step that his brothers Democharus and Proclus dreaded. Paralius sought out his third brother Athanasius. His older brothers treated Athanasius as a pariah. Despite a solid classical education including professional training at the renowned law school of Berytus, he had converted to Christianity while on a business trip to Alexandria. He proceeded to renounce the world and take up residence at the Enaton, a large anti-Chalcedonian monastery so named because it was located nine miles west of Alexandria. Before he left for Egypt, Paralius's brothers forbade him to contact Athanasius, an injunction that one must assume they had communicated to Horapollon as well. Despite this ban, Paralius sought out his brother. During the visit, the two brothers were joined by Athanasius's friend and fellow ascetic Stephen, a former sophist responsible for Athanasius's conversion to Christianity. As one would expect, their conversation turned to theology and the two monks raised a series of objections to Paralius's pagan beliefs. Paralius could not respond to these points and Stephen encouraged him to seek guidance from Horapollon and his colleagues Ammonius, Isidore, Heraiscus, and Asclepiodotus. When Paralius next visited his brother, he admitted that he had found his teachers' answers to Stephen's comments unpersuasive. However, the story that Asclepiodotus's child had been conceived through the intervention of the shrine of Isis in Menouthis still made Paralius trust in the power of the old gods. This popular miracle story was evidently repeated in the Alexandrian schools and in the communities to which the students who attended them returned. The Enaton monks asked Paralius to request from his teacher written proof that Asclepiodotus's wife was lactating; if such a statement could not be gotten, they held that the account of this event must be false. Despite these conversations, Paralius continued to behave in much the same way as other members of Horapollon's school. Some time after his second visit to Athanasius, probably in the spring of 486, Paralius visited the incubation shrine of Isis in Menouthis, which was popular among Alexandrian students. While he was there, the goddess appeared to him in a vision and identified one of his classmates as a magician. When Paralius mentioned this to his fellow students, he was told that the student he had so identified had a similar vision in which Paralius was marked as a magician. Paralius then traveled back to the Isis shrine, made the appropriate sacrifices, and asked for clarification. The goddess, however, failed to reappear. Enraged, Paralius returned to Alexandria and launched into a series of attacks against pagan gods and his teachers who worshipped them. He publicly mocked Horapollon, Asclepiodotus, Heraiscus, Ammonius, and Isidore for their devotion to the gods and, specifically, for their interest in the shrine of Isis at Menouthis. The shrine itself received particular criticism. He said its priestess was no more than a common prostitute who behaved lubriciously with anyone who approached her. These verbal attacks cut to the core of the scholarly community to which Paralius belonged. He had assailed the reputations of the teachers to whom he and his fellow students were bound and for whose interests they were expected to fight. His use of rather crude sexual innuendos to characterize the priestess of the Menouthis Isis shrine was both more vulgar and potentially more widely offensive. His peers knew of this temple from the stories about Asclepiodotus that were circulating, but some of them also had personal experiences with the priestess. With these personal attacks, Paralius had clearly overstepped the bounds of scholastic decorum. Paralius's behavior provoked a predictable response. On the following Friday, a day when Horapollon lectured from his home and the lecture halls were used for philosophical discussions, the students of Horapollon who had heard of Paralius's outbursts set upon him and beat him. Paralius just managed to escape them and fled into a small crowd of Christian students who were waiting for their philosophy lecture to begin. Three of these were student-philoponoi, Christian associates of the Enaton, the monastery to which Paralius's brother belonged. These students were well known in the porticos surrounding the lecture halls. They seem to have asked their classmates about their religious affiliations and rhetorical preferences and, if these students answered unsatisfactorily, the student-philoponoi then offered religious instruction as well as appropriate Christian rhetorical models. This exercise, they believed, helped to counteract the pagan influences in the curriculum and religious environment of the Alexandrian schools. Consequently, when Paralius fled to the group of student-philoponoi, Horapollon's outraged students perhaps sensed that a tangle with a group of outsiders tied to the Enaton would cause significantly more trouble than the beating of an insolent first-year student. They permitted the philoponoi to whisk Paralius away. With Paralius in their hands, these Christian students set about transforming his beating from punishment of an obnoxious teenager into a religious persecution launched by a hostile pagan intellectual establishment. Such a view of the recent events was, of course, consistent with their natural suspicion of pagan teachers, but it is notable nonetheless how brazenly the circumstances of the beating were altered. Writing later about the event, Zacharias Scholasticus, one of Paralius's philoponoi rescuers, blamed Horapollon for the beating and described wresting Paralius from the "murderous hands" of his attackers. He also praised the wounds Paralius had suffered for Christ. Each charge was plainly untrue. Paralius, who had never gone to a church service, could hardly be said to be a Christian and the beating was deliberately scheduled so that it occurred at a time when Horapollon was away from the classrooms (and could easily deny any involvement). Nevertheless, the inconvenient reality of the situation was ignored in the philoponoi portrayal of Paralius. Once this group arrived at the Enaton, the monks came to agree that Paralius had suffered unjust injuries for Christ. Led by the head of the monastery, they sent a delegation to explain the situation to the Alexandrian bishop, Peter Mongus. This was a significant step because Peter had become an extremely suspect figure among the anti-Chalcedonian leadership of the city. Indeed, he had at times faced open revolts of anti-Chalcedonian clergy and ascetics. The Enaton had long been a stronghold of anti-Chalcedonian opinion in Alexandria's western suburbs. Peter welcomed the opportunity to cooperate with them in order to turn Christian attention away from the Christological division of the city and towards a common pagan enemy. In Peter Mongus's hands, Paralius's beating underwent a further interpretation. Initially, Peter supported the student-philoponoi line by sending Paralius and a crowd of Christian supporters to the prefect of Egypt with a written endorsement of their complaint. In the meantime, the head of the Enaton spread word in the city about the "persecution" of Paralius and the anti-Christian actions of the Alexandrian teachers. By that afternoon, even before the court heard Paralius's complaint, the Christian population of the city had risen up against Horapollon and his colleagues. The teachers fled in the face of this popular outcry and, following Paralius's hearing, the prefect refused to call them back to the city (presumably for their own safety). On Friday, Peter Mongus simply put his authority behind the student-philoponoi version of events. On Saturday, however, he began to take ownership of this event for himself. That morning, Paralius and the Enaton monks returned and offered to show Peter the Isaic shrine in Menouthis. Seizing upon this unique opportunity, Peter Mongus organized a Saturday raid against the Menouthis shrine of Isis. Paralius was pressed into service as a guide and led a crew of anti-Chalcedonian monks from the Enaton and Chalcedonian monks from the eastern suburb Canopus to the small house-temple. By the end of Saturday afternoon, this mob had sacked the shrine, captured the priest in charge, and sent a written description of the idols contained within it to Peter Mongus. Some members of the raiding party stayed behind in Menouthis to wait for a convoy that would take the objects back to Alexandria the next morning. The rest returned to the city. On Sunday morning, Peter Mongus treated the assembled crowd to a magnificent spectacle. He walked into the church to hear the congregation chanting "Psychapollon," a play on Horapollon's name that poked fun at his soul-destroying teaching. When it came time for the sermon, the patriarch recounted the "persecution" of Paralius by pagans and glorified the Christian reaction to this. He spoke about the raid on the Isis shrine in Menouthis, a pagan temple that was anything but unknown in nearby Alexandria, and read the description of the idols that had been sent to him. He then led the congregation outside and supervised as they "brought out all of the pagan idols that they could find in the baths or in private houses, placed them down and burned them." At the conclusion of this bonfire, the camel convoy from Menouthis arrived. Peter ordered the camels to proceed into the center of the city, unload their cargo and display it to the excited mob of Christians that had assembled. Peter was joined by the prefect of Egypt, the chief of the corps of guards, the municipal senate, and the wealthy property owners of the city. When the parade and display of Menouthis miscellany finished, Peter ordered the captured priest of Isis forward to endure the jeers of the crowd and to undergo a mocking inquisition from Peter. As Sunday afternoon came to a close, the crowd lavished praises on Peter, the civic notables, and the emperor Zeno before dispersing. In the end, Peter Mongus and his supporters had capitalized upon Paralius's Friday confrontation with his student peers to present an impromptu weekend of anti-pagan activity. Once Peter saw the chance to raid the Menouthis Isis shrine, it seems that he carefully stage-managed the entire affair. In fact, this followed an old and familiar script, evoking the events of Theophilus's famous raid on the Alexandrian Serapeum in 391. In both cases, the temples were patronized by pagan intellectuals and their sack was precipitated by pagan student violence against Christians. Both sacks were authorized by the bishop of the city and each culminated in a parade and public destruction of the religious objects found on site, which were led by the bishop and prominent members of the community. The Serapeum destruction had helped to establish bishop Theophilus's ferocious anti-pagan reputation, and Peter Mongus, whose political position was far from secure in 486, evidently hoped to bask in some reflected glory. This sequence unfolded in a short forty-eight-hour span. In that time, one can witness a progression of events that escalated intercommunal tensions in the city and transformed the meaning of Paralius's encounter with his classmates. On Friday afternoon, the punitive beating of an overly assertive and disruptive first-year student served merely to defend the scholastic hierarchy that held a small group of students together. By Sunday evening, however, this isolated incident had evolved from a disciplinary beating within a scholastic setting into an act of religious violence with implications for the Christian and pagan communities in Alexandria and its suburbs. What is more remarkable, however, is the way the meaning of these events had been constructed. When hands were first placed upon Paralius on that Friday afternoon, the reason for and meaning of this assault must have been clear to both Paralius and his attackers. When Paralius fled from his attackers to the student-philoponoi and agreed to accompany them to the Enaton, he permitted the events to be redefined, first as religious persecution of a Christian by pagan students, and later as an act sanctioned by "soul-destroying" pagan teachers. The scope of the event again expanded when Peter Mongus intervened. The beating of Paralius now represented a link in the chain of pagan-Christian confrontations that had helped to define the Alexandrian patriarchate. The speed of this evolution is particularly impressive. In two days' time, Paralius, a previously nondescript teenager, had become a symbol whose importance resonated because of the preexisting communal histories that illustrated the particular virtues, vices, and modes of behavior appropriate for students, lay Christians affiliated with monasteries, and the Alexandrian bishop. The students of Horapollon knew Paralius to be an aggressive and disrespectful student who questioned the integrity of respected teachers and institutions in a particularly vulgar manner. According to the informal code of scholastic behavior, these attacks merited an aggressive, even violent response. Under different circumstances, Paralius's beating would have been ignored beyond the schools. However, to the student-philoponoi, a group with an inimical relationship to pagan teachers and their students, Paralius's narrow escape from a murderous mob of his peers confirmed their historical suspicion of Alexandrian pagan intellectuals. Peter Mongus, by contrast, saw Paralius through a lens fashioned by the historical traditions of the Alexandrian patriarchate. Peter saw that this pagan violence could be presented as a moment like that faced by his great predecessor Theophilus. He was interested in making the reality of his contemporary situation correspond to the paradigms established by previous patriarchs. In this way, Peter was both responding to the historical traditions of the community he headed and reshaping the present to resemble this idealized past. At various times, the members of Horapollon's intellectual circle, the student-philoponoi, and the leadership of the Alexandrian church all relied upon the historical foundations of their communities and the value structures these supported to shape their interpretations of present events. The contradictions between these interpretations highlight the differences between the historical traditions that defined these groups. Nevertheless, in each context, the reaction to Paralius's situation was quick and the communal understanding of its significance was almost immediately appreciated. This shows a remarkable awareness within each group of the way in which past (and present) events supported the core values each group held. Perhaps just as interesting as the ways in which these group identities shaped perceptions of present events is the way in which the events surrounding Paralius were later incorporated into communal historical narratives. Despite the pageantry of the parade of idols from Menouthis, Peter Mongus's anti-pagan activities in 486 did little to shape his historical legacy. Later literary sources, including a history written by the former philoponos Zacharias Scholasticus, remember Peter instead as a controversial and misunderstood champion of anti-Chalcedonian orthodoxy. The legacy of the riot lived on within the circle of student-philoponoi. In the early 490s, Zacharias Scholasticus wrote a text designed to assert their ownership of this event. He reflects particularly upon the student-philoponoi and the religious situation in the schools. For the pagan philosophers, sophists, and grammarians who taught in Alexandria, this riot and the events that followed it forced them to reconsider the roles they played in the world. As time passed, their focus turned to an imperial investigation that followed the riot and its use of torture and coercion to persecute Alexandrian pagan teachers. This led to a dramatic recalibration of the communal past within this group of intellectuals. Alexandrian traditions about passive pagan philosophical resistance to Christian persecution became popular and even influenced some of the teaching done in Neoplatonic classrooms. Paralius's beating is of little significance to the larger history of the eastern Mediterranean. No great empires fell, no cities changed hands, no one died, and much of what transpired was quickly forgotten even by the general Alexandrian population. Nevertheless, our record of the events of those few days in 486 sheds considerable new light upon the functioning of late antique intellectual and spiritual communities. Paralius's experiences make it possible to appreciate what could initially attract a person to a community, how one joined, and the importance of conformity within these groups. We can also see how these groups used the past to provide practical illustration of the ideals, beliefs, and behaviors they valued. We can further witness the degree to which inclusion in the community relied upon an acceptance of a shared interpretation of the past. It also becomes clear, however, that a high degree of interpretative flexibility existed. If social conditions changed, almost forgotten traditions could be revived or new ones created that better conveyed a set of virtues and ideal behaviors appropriate to the present circumstances. While this discussion has summarized Paralius's scholastic career, much remains to be said about the groups involved in these events and the ways in which traditions about the past shaped their behavior. At least since the work of Edward Gibbon, the interaction of classically-trained intellectuals, Christian ascetics, and bishops has preoccupied many scholars of the later Roman world. This is with good reason. In their own distinct ways, people belonging to each of these groups created, sustained, and challenged many of the structures that made the late antique world functional. Of these three, intellectuals enjoyed the most long-standing positions of influence. Since the advent of the Roman imperial system, teachers provided the education (paideia) that shaped the minds and characters of the Roman cultivated class. The value of this training was widely recognized. Paideia armed students with an arsenal of rhetorical skills and literary references shared, at least ostensibly, by the elite of the Roman world. It also bestowed upon its possessors a certain refined sensibility and awareness of the essential virtues that defined one as a gentleman. Later Roman intellectuals provided their charges with an outline of how they were to act, how they were to treat other men, and what role they were to play in their communities. By creating a mode of expression and set of social expectations common to the Roman imperial elite, paideia and the intellectuals who passed along its values helped to sustain the cohesion of the empire. The formative role played by intellectuals was an occasional source of tension. Intellectuals stood out as some of the most outspoken pagans in the Roman East and, as Christianity became increasingly important in the Roman world, the interests and values of pagan teachers seemed increasingly out of step with the goals of a Christian empire. In absolute terms, their numbers may have been small, but their social position, literary habits, and intellectual authority made these pagan intellectuals disproportionately influential. Most refrained from using their positions to publicly advocate for polytheism or defend specific cultic practices, but the environment they fostered provoked some Christian students to complain that, in their schools, "it is hard to avoid being carried away by (the gods') devotees and adherents." Emperors too recognized that teachers could affect the religious attitudes of their students and regulated the activities of intellectuals in order to further their own religious agendas. To survive in this environment, pagan intellectuals needed to maintain a balance between their personal theological ideas and the larger social role they were expected to play. Ascetics often seem as emblematic of late antiquity's dynamic Christian social order as pagan intellectuals are of its classical cultural traditions. Ascetics, late Roman Christian authors tell us, lived the life of angels on the earth by "forsaking their homes and families...in order to be anxious only about the things of the Lord." The supposed purity of their thought and spiritual inspiration of their actions allowed monks to claim great authority within Christian communities. They are often described as spiritual mentors and mediators who encouraged individual Christians to be pious and offered to intervene on their behalf with the divine. A range of late antique sources speak of ascetics playing a concrete social role as well. Authors speak about monks who resolve disputes, advocate for the poor, intervene with imperial administrators, and even advise the emperor. While it is often quite difficult to disentangle the real activities of Christian ascetics from the literary treatments that idealize their conduct, there can be little doubt that some ascetics played these important public roles at least some of the time. The public involvement of Christian ascetics was not always for the best. The same purity of spirit that enabled monks to play a public role also could be construed as liberating them from the bonds of social convention. For this reason, monks sometimes served as shock troops in late antique Christian battles against heresy and paganism. Many such incidents feature in the exaggerated and formulaic literary creations that celebrate ideal ascetic behavior. Often these texts describe somewhat restrained demonstrations and protests, but credible accounts of ascetic religious violence also come down from late antiquity. They range from the Egyptian abbot who burglarized and threw urine at the house of a local noble suspected of pagan activity to the bands of monks held responsible for destroying temples and terrorizing villagers in the Syrian countryside in the 380s. The achievements of leading monks brought new recruits to monasteries and prompted laymen to incorporate ascetic discipline into their lives in the world. Taken to extremes, these new sets of social behaviors threatened to disrupt the basic rhythms of social life. In much the same way that pagan intellectuals could seem to be holding back the development of a new Christian order, so too did Christian ascetics sometimes appear overly eager to press for the emergence of an orthodox, fully Christian empire. Like pagan intellectual circles, ascetic communities needed to strike a balance between the particular ideas that were valued inside their group and the actions that their members and associates took in the wider world. Bishops, too, represent essential but problematic fixtures of the later Roman social and religious landscape. Some bishops had an ascetic background, but most could not claim the sort of charismatic authority that belonged to ascetics. Episcopal authority derived instead from the recognition that the ecclesiastical establishment bestowed upon individual leaders. Often these men were already figures of considerable local political importance and were expected to advocate publicly for the interests of their congregations. The real authority of a bishop, however, derived from the role that he played within a Christian community. The bishop supervised Christians' religious growth by welcoming newcomers into the church, presiding over their baptisms, and preaching sermons that guided their conduct. Christians expected leadership from their bishops. This could have a political component, but any such activity could not conflict with more important ecclesiastical duties. Some of this was because, in spite of many premature obituaries, the old civic order continued to function effectively in the late antique Roman East. In most cases, bishops worked alongside this old power structure and were either supported or restrained by it. More important, however, was the Christian belief that the spiritual authority of a bishop derived from the inspiration of the Holy Spirit. If the bishop truly enjoyed this spiritual connection, his personal conduct would reflect a similar divine inspiration. Too great an involvement in political affairs could make a bishop look base or power-hungry. His social role was thus constrained both by political circumstances and by a set of Christian expectations that he could influence but not completely reshape. Communal history helped intellectuals, ascetics, and bishops distinguish between appropriate and inappropriate behaviors. By the 480s, these groups all enjoyed extremely long histories and had developed sophisticated mechanisms for both preserving and communicating their collective pasts. Indeed, it is important to emphasize how deep into late antiquity we are when Paralius's beating takes place. The Christian empire inaugurated by Constantine was then only a few decades younger than the American Republic of Washington is now. In 486, the Western Roman Empire no longer existed as a political entity, the last openly pagan emperor had died nearly a century and a quarter before, and ascetics (the youngest of these three groups) had been a presence in the cities and countryside of Egypt and the East for two hundred years. And yet the Alexandria in which the deep pasts of intellectuals, ascetics, and bishops intersected with present realities remained a religiously heterogeneous place. It was a city in which pagan philosophers fascinated by a lock of the goddess Isis's hair floating down a Nile canal walked by Christian ascetics mulling the consequences of the Council of Chalcedon. When these men passed each other, they carried with them the memory of previous generations of intellectuals, ascetics, and bishops who had interacted with one another in both exemplary and shameful ways. On one level, the riot is then an idiosyncratically Alexandrian story born from the unique dynamics of an old and crowded city. And yet there are two reasons that one should not discount the wider historical significance of this event or dismiss it as yet another example of Alexandrian (or Egyptian) exceptionalism. First, excluding the Alexandria bishop, the figures involved in the riot are largely non-Egyptian. Paralius is from Aphrodisias. His teacher Horapollon and his colleagues are from places as diverse as Caria, Egypt, Syria, and Greece. Paralius's student rescuers and their supporters in the Enaton monastery come from a wide range of cities across the Levant and Asia Minor. Alexandria represented the site of this conflict, but the people involved arrived there from a host of other locations and brought with them a broad set of interests. There is also nothing specifically Egyptian about the notions of the past that influenced these groups or the mechanisms through which they were passed along. As this study will show, intellectual circles across the Mediterranean had used many of the same mechanisms to preserve historical traditions and instill a sense of community among students since at least the fourth century B.C. The Alexandrian riot may represent a particularly clear moment of conflict between these traditions and the ideas of the wider world, but neither the traditions themselves nor the process of their transmission are particularly exceptional. The same is broadly true of the historical material that circulated among the ascetics and their associates involved in the riot. 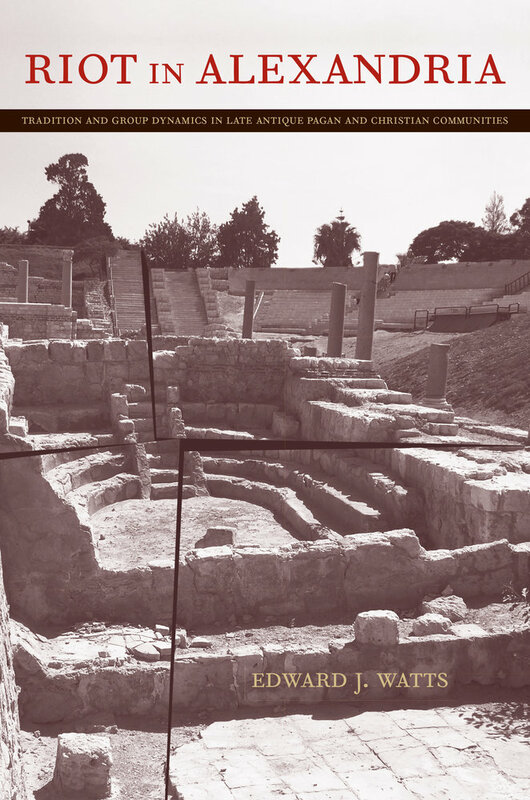 As will be shown in chapter 5, there is considerable overlap between the ideas and traditions that circulated in late fifth-century Alexandrian and Palestinian anti-Chalcedonian monasteries. In addition, the sharing of this material within monastic circles and the transmission of it to a wider public followed patterns that can be documented as early as the second quarter of the fourth century. Here too, the Alexandrian riot reveals not an exceptional community but only a particularly clear instance in which these traditions influenced behavior. The Alexandrian episcopate, of course, poses a different challenge. It did, in fact, create a distinctive historical discourse that centered on the actions of leading Egyptians and defined the scope of episcopal action in Egyptian terms. Even here, though, Alexandrian bishops faced popular expectations and constraints on their behavior much like those encountered by bishops across the empire. While they drew upon a specifically Egyptian discourse to define the appropriate spheres of episcopal action, bishops elsewhere shared their broader concerns and strategies. This suggests that the intellectuals, ascetics, and Alexandrian bishop involved in the riot must be appreciated against the larger backdrop of late Roman society. Consequently, before embarking upon a specific study of these actors, it is important first to understand the ways in which similarly constituted intellectual, ascetic, and ecclesiastical groups used the past to shape their communities in late antiquity. Such an approach allows one to understand how, broadly speaking, communal histories contributed to the architecture of later Roman social and religious groups. At the same time, it will permit a better understanding of the relevance of these small actors to general trends in the larger cultural history of late antiquity. While each section of this study ultimately focuses upon the Alexandrian environment of the 480s, Paralius's beating will serve as a framework around which to construct a discussion of the ways in which traditions of the past assisted in the cultural construction of late antique intellectual, ascetic, and ecclesiastical communities. 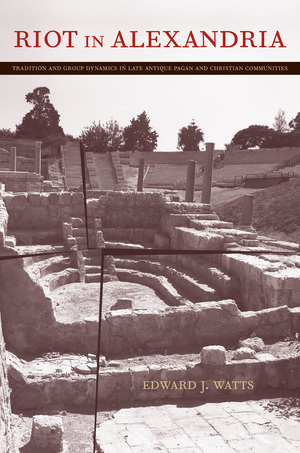 Though distinct, these three studies will proceed in a similar fashion; they will begin with a general exploration of the place of historical traditions within communities of the sort found in late-fifth-century Alexandria. They will then move to a more specific discussion focusing upon the traditions operative in the Alexandrian communities active in the events of 486. This study will serve two purposes. First, a more developed understanding of the personalities and communities involved in this riot should make clear how communal ideas about a shared past helped to shape the interactions between pagan intellectuals, Christians involved with monasteries, and the Alexandrian church. Second, and most importantly, this discussion will show that the social and religious changes that seized the late Roman world did little to disrupt the patterns of interpersonal communication that enabled individuals to identify with a particular community. Despite the rise of Christianity and the greater institutional organization that is often seen as characteristic of the later Roman Empire, personal connections and individual interactions remained the most important ways that people came to understand their proper place in the world. Ultimately, it is hoped that this study can bring us a bit closer to the ordinary human faces and human voices that played such an important part in the gradual evolution of late antique society. This innovative study uses one well-documented moment of violence as a starting point for a wide-ranging examination of the ideas and interactions of pagan philosophers, Christian ascetics, and bishops from the fourth to the early seventh century. Edward J. Watts reconstructs a riot that erupted in Alexandria in 486 when a group of students attacked a Christian adolescent who had publicly insulted the students' teachers. Pagan students, Christians affiliated with a local monastery, and the Alexandrian ecclesiastical leaders all cast the incident in a different light, and each group tried with that interpretation to influence subsequent events. Watts, drawing on Greek, Latin, Coptic, and Syriac sources, shows how historical traditions and notions of a shared past shaped the interactions and behavior of these high-profile communities. Connecting oral and written texts to the personal relationships that gave them meaning and to the actions that gave them form, Riot in Alexandria draws new attention to the understudied social and cultural history of the later fifth-century Roman world and at the same time opens a new window on late antique intellectual life. Edward J. Watts, Associate Professor in the Department of History at Indiana University, is the author of City and School in Late Antique Athens and Alexandria, winner of the Outstanding Publication Award from the Classical Association of the Midwest and South. Appendix 2. How Much Should We Trust Zacharias Scholasticus? 2010 PROSE Award Honorable Mention in Classics & Ancient History, Association of American Publishers, Inc.